Did you know that there are 23 billion IoT embedded devices currently deployed around the world? This figure is expected to grow to a whopping 1 trillion devices by 2050! Less known, is that 80% of IoT devices are based around Arm’s Cortex-M microcontroller technology. Sometimes clients ask us if we support their Arm Cortex-M based demo-board of choice. The answer is simply: yes! The ASN Filter Designer has an automatic code generator for Arm Cortex-M cores, which means that we support virtually every Arm based demo-board: ST, Cypress, NXP, Analog Devices, TI, Microchip/Atmel and over 200+ other manufacturers. Our compatibility with Arm’s free CMSIS-DSP software framework removes the frustration of implementing complicated digital filters in your IoT application – leaving you with code that is optimal for Cortex-M devices and that works 100% of the time. Simply load your sensor data into the ASN Filter Designer signal analyser and perform a detailed analysis. After identifying the wanted and unwanted components of your signal, design a filter and test the performance in real-time on your test data. Export the designed design to Arm MDK, C/C++ or integrate the filter into your algorithm in another domain, such as in Matlab, Python, Scilab or Labview. Use the tool in your RAD (rapid application development) process, by taking advantage of the automatic code generation to Arm’s CMSIS-DSP software framework, and quickly integrate the DSP filter code into your main application code. Let the tool analyse your design, and automatically generate fully compliant code for either the M0, M0+, M3, M4 and the newer M23 and M33 Cortex cores. Deploy your design within minutes rather than hours. We are proud that we are an Arm knowledge partner! As an Arm DSP knowledge partner, we will be kept informed of their product roadmap and progress for the coming years. 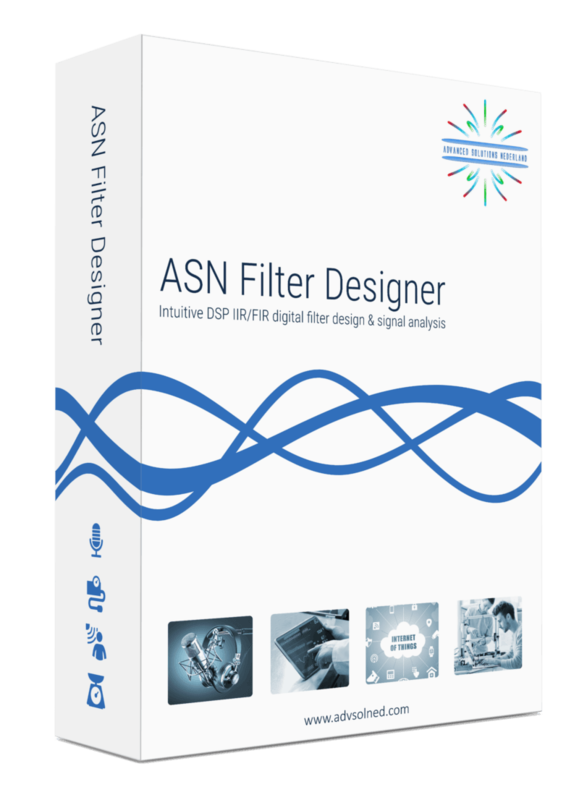 Try it for yourself and see the benefits that the ASN Filter Designer can offer your organisation by cutting your development costs by up to 75%! ASP vs DSP – which one do I choose for my IoT application? 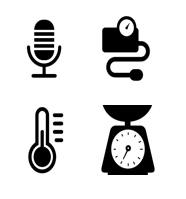 Sensors come in all type of shapes and forms… There are sensors for audio, pressure, temperature, weight, strain, light, humidity…the list is almost endless. The challenge for most, is that many sensors used in these IoT measurement applications require filtering in order to improve the performance of the sensor’s measurement data in order to make it useful for analysis. Before jumping into the disussion, let’s first have a look at what sensor data really is…. Unwanted components degrade system performance and need to be removed. So, the challenge for every designer is first to identify what aspects of the data we want to keep, i.e. ‘the wanted components’ and what we need to filter out, the so called ‘unwanted components’. After establishing what need to be filtered out, the challenge then which domain do we tackle this problem in, i.e. the analog domain or in the digital domain ? Each domain has its pros and cons, as we will now discuss for a practical classic sensor measurement challenge using a loadcell. A classic sensor measurement challenge using a loadcell is shown below. Looking at the hardware setup, we see that have a loadcell excited by a DC excitation voltage, and the general idea is that the sensor’s differential bridge voltage is amplifier by the instrumentation amplifier (IA) when strain is applied. For those of you unfamiliar with this type of technology, a loadcell is a strain measurement sensor that is comprised of 4 strain gauges, it’s also referred to as a Wheatstone bridge, hence the terminology bridge sensor. Analysing the signals in the schematic, we see that the differential voltage is passed through 2 filters in order to remove powerline interference and reduce measurement noise. The Instrumentation amplifier (IA) has high impedance inputs, which makes it easy to connect EMI (electromagnet interference) filters to the inputs. However, any mismatches with these filters will generally degrade the instrumentation amplifier’s common-mode rejection ratio, which is undesirable. The instrumentation amplifier usually has a large gain (100 is quite typical), so any unwanted differential voltage on the inputs will be amplified. Looking at the filters, the notch depth of the powerline cancellation (50Hz/60Hz) filter will be dependent on component tolerances, and will vary over time and with temperature…This is problematic as we’ll discuss in the following section. Finally, any analog filter or filters will require careful PCB layout and eat up precious board space, which is undesirable for many modern devices. Loadcell digital – is digital any better ? Replacing the instrumentation amplifier with a 24bit sigma-delta ADC (analog-to-digital converter), we simplify the circuitry – although many ADCs don’t tolerate high impedance at their inputs, which may be problematic for good RFI (radio frequency interference) filter design. Nevertheless, some sigma-delta devices have an in-built 50/60Hz notch filter which simplifies the filtering requirement. Although these devices are more expensive, and the choice of sampling frequency is limited, they may be good enough for some applications. So, which domain is best for solving our measurement challenge, i.e. do we use analog signal processing (ASP) or digital signal processing (DSP)? In order to answer this objectively, we need to first breakdown the pros and cons of each domain. Let’s first look at an implementation using ASP. The most obvious advantage is that analog filters have excellent resolution, as there are no ‘number of bits’ to consider. Analog filters have good EMC properties as there is no clock generating noise. There are no effects of aliasing, which is certainly true for the simpler op-amps, which don’t have any fancy chopping or auto-calibration circuitry built into them, and analog designs can be cheap which is great for cost sensitive applications. Sound great, but what’s the bad news? Analog filters have several significant disadvantages that affect filter performance, such as component aging, temperature drift and component tolerance. Also, good performance requires good analog design skills and good PCB layout, which is hard to find in the contemporary skills market. One big minus point is that filter’s frequency response remains fixed, i.e. a Butterworth filter will always be a Butterworth filter – any changes the frequency response would require physically changing components on the PCB – not ideal! Let’s now look at an implementation using DSP. The first impression is that a digital solution is more complicated, as seen above with the five building blocks. However, digital filters have high repeatability of characteristics, and as an example, let’s say that you want to manufacture 1000 measurement modules after optimising your filter design. With a digital solution you can be sure that the performance of your filter will be identical in all modules. This is certainly not the case with analog, as component tolerance, component aging and temperature drift mean that each module’s filter will have its own characteristics. Digital filters are adaptive and flexible, we can design and implement a filter with any frequency response that we want, deploy it and then update the filter coefficients without changing anything on the PCB! It’s also easy to design filters with linear phase and at very low sampling frequencies – two things that are tricky with analog. The effect of aliasing and if designing in fixed point, finite word length issues must be taken into account, including the limitation of the ADC and DAC. As there is clock source, digital designs will produce more EMI than analog filters. When designing modern IoT sensor measurement applications, digital filters offer a greater degree of design flexibility and high repeatability of characteristics over their analog counterparts. With the advent of modern processor technology and design tooling, it is estimated that about 80% of IoT smart sensor devices are currently deployed using digital devices, such as Arm’s Cortex-M family. The Arm Cortex-M4 is a very popular choice with hundreds of silicon vendors, as it offers DSP functionality traditionally found in more expensive DSPs. Implementation is further simplified by virtue of ASN’s strong partnership with Arm who together provide a rich offering of easy to use filter design tooling and a free DSP software framework (CMSIS-DSP). These tools and well documented software framework allow you to get your IoT application up and running within minutes. http://www.advsolned.com/wp-content/uploads/2018/07/analog_loadcellfilt.png 290 1224 admin http://www.advsolned.com/wp-content/uploads/2018/02/ASN_logo.jpg admin2018-07-15 19:12:022018-08-02 13:52:30ASP vs DSP - which one do I choose for my IoT application? 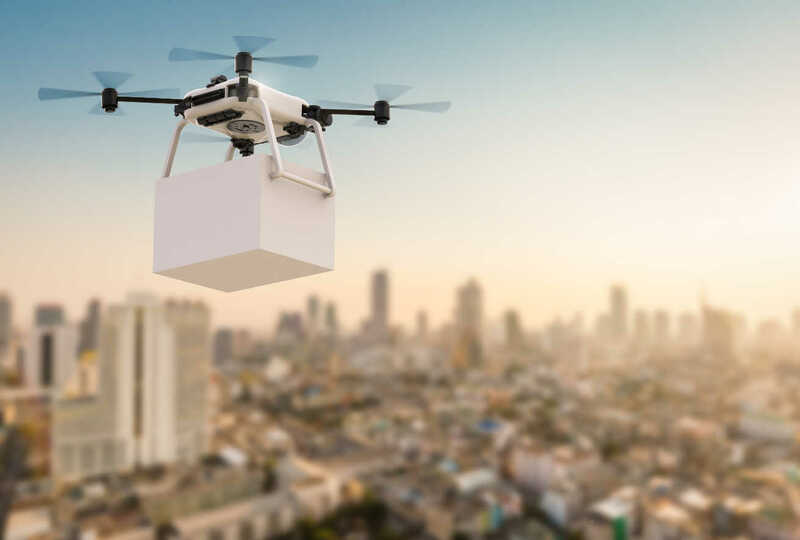 Drones are one of the golden nuggets in IoT. No wonder, they can play a pivotal role in congested cities and far away areas for delivery. Further, they can be a great help to give an overview of a large area or places which are difficult or dangerous to reach. However, most of the technology is still in its experimental stage. 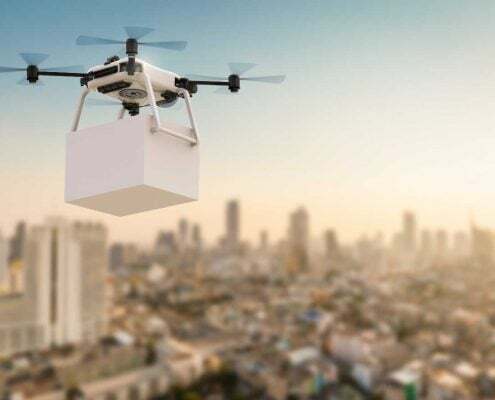 Because drones have a lot of sensors, Advanced Solutions Nederland did some research on how drone producing companies have solved questions regarding their sensor technology, especially regarding DC motor control. We found out that most producers spend weeks or even months on finding solutions for their sensor technology challenges. With the ASN Filter Designer, he/she could have come to a solution within days or maybe even hours. Besides, we expect that the measurement would be better too. The biggest time coster is that until now algorithms were developed by handwork, i.e. they were developed in a lab environment and then tested in real-life. With the result of the test, the algorithm would be tweaked again until the desired results were reached. However, yet another challenge stems from the fact that a lab environment is where testing conditions are stable, so it’s very hard to make models work in real life. These steps result in rounds and rounds of ‘lab development’ and ‘real life testing’ in order to make any progress -which isn’t ideal! Design, analyse and implement filters for drone sensor applications with real-time feedback and our powerful signal analyser. Design filters for speed and positioning control for sensorless BLDC (brushless DC) motor applications. Speed up deployment to Arm Cortex-M embedded processors. One of the key benefits of the ASN Filter Designer and signal analyser is that it gives real-time feedback. Once an algorithm is developed, it can easily be tested on real-life data. To analyse the real-life data, the ASN Filter Designer has a powerful signal analyser in place. You can easily design, analyse and implement filters for a variety of drone sensor applications, including: loadcells, strain gauges, torque, pressure, temperature, vibration, and ultrasonic sensors and assess their dynamic performance in real-time for a variety of input conditions. With the ASN Filter Designer, you don’t have do to any coding yourself or break your head with specifications: you just have to draw the filter magnitude specification and the tool will calculate the coefficients itself. Perform detailed time/frequency analysis on captured test datasets and fine-tune your design. Our Arm CMSIS-DSP and C/C++ code generators and software frameworks speed up deployment to a DSP, FPGA or micro-controller. BLDC (brushless DC) BLDC motors have found use in a variety of application areas, including: robotics, drones and cars. They have significant advantages over brushed DC motors and induction motors, such as: better speed-torque characteristics, high reliability, longer operating life, noiseless operation, and reduction of electromagnetic interference (EMI). One advantage of BLDC motor control compared to standard DC motors is that the motor’s speed can be controlled very accurately using six-step commutation, making it a good choice for precision motion applications, such as robotics and drones. For most applications, monitoring of the back-EMF (back-electromotive force) signal of the unexcited phase winding is easier said than done, since it has significant noise distortion from PWM (pulse width modulation) commutation from the other energised windings. The coupling between the motor parameters, especially inductances, can induce ripple in the back-EMF signal that is synchronous with the PWM commutation. As a consequence, this induced ripple on the back EMF signal leads to faulty commutation. Thus, the measurement challenge is how to accurately measure the zero-crossings of the back-EMF signal in the presence of PWM signals? A standard solution is to use digital filtering, i.e. IIR, FIR or even a median (majority) filter. However, the challenge for most designers is how to find the best filter type and optimal filter specification for the motor under consideration. The ASN Filter Designer allows engineers to work on speed and position sensorless BLDC motor control applications based on back-EMF filtering to easily experiment and see the filtering results on captured test datasets in real-time for various IIR, FIR and median (majority filtering) digital filtering schemes. The tool’s signal analyser implements a robust zero-crossings detector, allowing engineers to evaluate and fine-tune a complete sensorless BLDC control algorithm quickly and simply. Can I save time and money, and reduce the headache of design and implementation with an investment in new tooling? Our licensing solutions start from just 125 EUR for a 3-month licence. Find out what we can do for you, and learn more by visiting the ASN Filter Designer’s product homepage. It’s estimated that the global smart sensor market will have over 50 billion smart devices in 2020. At least 80% of these IoT/IIoT smart sensors (temperature, pressure, gas, image, motion, loadcells) will use Arm’s Cortex-M technology – where the largest growth is in smart Image sensors (ADAS) & smart Temperature sensors (HVAC). The challenge for most, is that many sensors used in these applications require a little bit of filtering in order to clean the measurement data in order to make it useful for analysis. DSP means Digital Signal Processing and is a mathematical recipe (algorithm) that can be applied to IoT sensor measurement data in order to clean it and make it useful for analysis. But that’s not all! DSP algorithms can also help in analysing data, producing more accurate results for decision making with ML (machine learning). They can also improve overall system performance with existing hardware (no need to redesign your hardware – a massive cost saving! ), and can reduce the data sent off to the cloud by pre-analysing data and only sending what is necessary. Nevertheless, DSP has been considered by most to be a black art, limited only to those with a strong academic mathematical background. However, for many IoT/IIoT applications, DSP has been become a must in order to remain competitive and obtain high performance with relatively low cost hardware. Consider the following application for gas sensor measurement (see the figure below). The requirement is to determine the amplitude of the sinusoid in order to get an estimate of gas concentration (bigger amplitude, more gas concentration etc). Analysing the figure, it is seen that the sinusoid is corrupted with measurement noise (shown in blue), and any estimate based on the blue signal will have a high degree of uncertainty about it – which is not very useful if getting an accurate reading of gas concentration! After ‘cleaning’ the sinusoid (red line) with a DSP filtering algorithm, we obtain a much more accurate and usable signal which helps us in estimating the amplitude/gas concentration. Notice how easy it is to determine the amplitude of red line. This is only a snippet of what is possible with DSP algorithms for IoT/IIoT applications, but it should give you a good idea as to the possibilities of DSP. How do I use this in my IoT application? As mentioned at the beginning of this article, 80% of IoT smart sensor devices are deployed on Arm’s Cortex-M technology. The Arm Cortex-M4 is a very popular choice with hundreds of silicon vendors, as it offers DSP functionality traditionally found in more expensive DSPs. 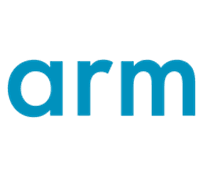 Arm and its partners provide developers with easy to use tooling and a free software framework (CMSIS-DSP) in order to get you up and running within minutes. With the advent of smart cities, and society’s obsession of ‘being connected’, data networks have been overloaded with thousands of IoT sensors sending their data to the cloud, needing massive and very expensive computing resources to crunch the data. massive datasets – as such there is no more room for scalability. The situation is further complicated with the fact, that a majority of sensor data is coming from remote locations, which also presents a massive security risk. It’s estimated that the global smart sensor market will have over 50 billion smart devices in 2020. At least 80% of these IoT/IIoT smart sensors (temperature, pressure, gas, image, motion, loadcells) will use Arm’s Cortex-M technology, but have little or no smart data reduction or security implemented. Namely, how do we reduce our data that we send to the cloud, ensure that the data is genuine and how do ensure that our Endpoint (i.e. the IoT sensor) hasn’t been hacked? The cloud is not infallible! Traditionally, many system designers have thrown the problem over to the cloud. Data is sent from IoT sensors via a data network (Wifi, Bluetooth, LoRa etc) and is then encrypted in the cloud. Extra services in the cloud then perform data analysis in order to extract useful data. So, what’s the problem then? This model doesn’t take into account invalid sensor data. A simple example of this, could be glue failing on a temperature sensor, such that it’s not bonded to the motor or casing that it’s monitoring. The sensor will still give out temperature data, but it’s not valid for the application. As for data reduction – the current model is ok for a few sensors, but when the network grows (as is the case with smart cities), the solution becomes untenable, as the cloud is overloaded with data that it needs to process. No endpoint security, i.e. the sensor could be hacked, and the hacker could send fake data to the cloud, which will then be encrypted and passed onto the ML (machine learning) algorithm as genuine data. Algorithms, algorithms….. and in built security blocks. Over the last few years, hundreds of silicon vendors have been placing security IP blocks into their silicon together with a high performance Arm Cortex-M4 core. These so called enhanced micro-controllers offer designers a low cost and efficient solution for IoT systems for the foreseeable future. A lot can be achieved by pre-filtering sensor data, checking it and only sending what is neccessary to the cloud. However, as with so many things, knowledge of security and algorithms are paramount for success.